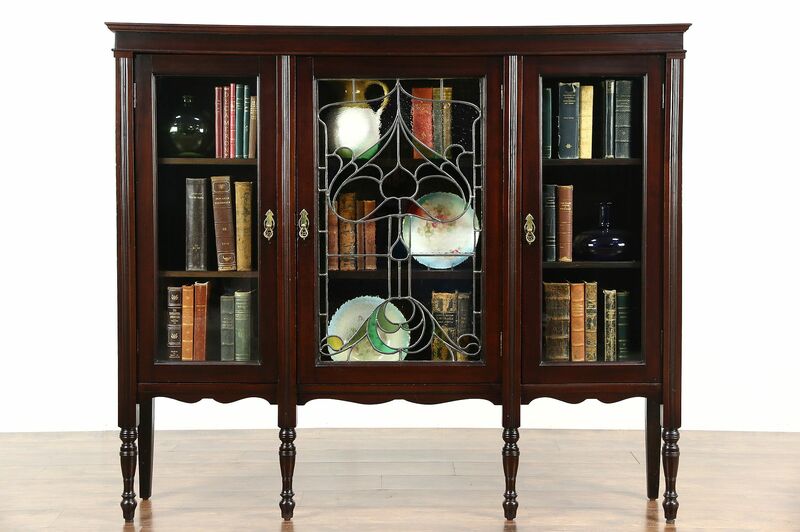 A triple bookcase from about 1910 is solid mahogany with a stained hand leaded glass center door. The restored finish is in excellent condition on this American made antique library furniture. Side doors have original wavy glass. The stained glass shows Art Nouveau influence and has tiny hairline cracks at several tips, see photos. The top has a warp from age, see photos. Three separate banks of shelves are adjustable. Brass hardware is old but later. Size is 61" wide, 13" deep and 52" tall.